Oh God, how I have f***g computers! I spent four hours working on this newsletter yesterday to minimise the time I had to spend on it today. This morning I woke bright eyed and bushy tailed at 5am ready to put the finishing touches to it. Guess what? After a laborious twenty minutes for my not-so-old laptop to boot up I discovered that the Microsoft Word auto save function had failed to save anything other than a week old file containing just three words out of the one thousand words typed into it yesterday. Ah well, I try live a stress free life afloat now so, deep breath, and off we go again. Last Monday I left my Calcutt Boats mooring for the first time in ten days. Much as I appreciate the security and facilities, not to mention dry paths underfoot, being able to see something other than the side of a sixty feet long hire boat pressed hard against my port side was a real joy. With Cynthia still stranded an hour’s drive from New York waiting for the outcome of her marriage visit visa application I had both boat and basset hounds to manage on my own. The boat was no problem. I’ve been doing it for years so I can cruise almost as easily on my own as I can with a crew. The two dogs were a different matter. I’ve owned many different dogs over the years but I didn’t know anything about Basset hounds until Bromley and Tasha arrived on board just over two weeks ago. They’re lovely dogs with a very placid nature, but they would rather follow scents than instructions and with limbs more akin to castors than legs, jumping over the side of the boat into the well deck to gain access to the boat’s front doors is difficult for them. Bromley, the six year old, can’t manage it at all on his own because of neurological issues which mean that he doesn’t have much control of his legs. He needs lifting on and off the boat and, because his dustbin sized feet drag through the constant towpath mud at this time of the year, he needs a fair amount of cleaning each time he returns from a towpath toilet trip. Mud, mud and more mud. The conditions rather than the dogs are the real problem. Moving people and animals on and off boats takes so much longer this time of the year. Summer, autumn and spring are wonderful. Even cold and frosty days are a joy, but after a month of almost daily rain squelching through inches of liquid mud just isn’t pleasant. Having the right footwear helps tremendously. Rigger boots or Wellingtons are very handy. Being able to slip them on and off without time consuming lace tying saves so much time. If they worked as well for dogs as they do for people but Tash and Bromley would have a pair each. Two pairs each I suppose. The three of us spent a pleasant and uneventful night half way between Napton and Braunston junctions before an early morning start on Tuesday for JG Marine close to Braunston bottom lock. Justin Greene fitted a Webasto diesel burner for me a couple of months ago. This scheduled two day visit was for him to remove the three old radiators plumbed into my stove’s back burner and replace them with four new radiators. I had forgotten just how much upheaval is necessary when you have major work done on a live aboard boat. 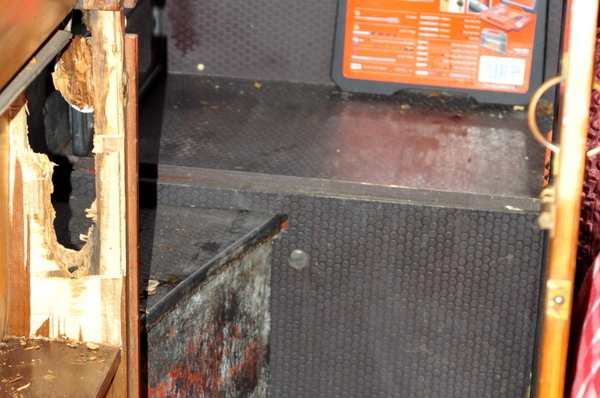 In November 2011 I had my old and leaking wooden cabin over plated with steel. I spent weeks returning the boat to some kind of order after the work was done but at least I didn’t have to disrupt all me precious possessions too much. This time all the work was done inside the boat by up to three people simultaneously working in different locations. The thirty eight year old radiators were filled with a thick tar like sludge which Justin’s plumber friend, BJ, tried very hard to keep away from all my soft furnishings and clothing, but he wasn’t always successful. As he removed each section of copper pipe he carefully plugged either end with wads of blue roll before throwing the six feet lengths through my side hatch onto the wharf. Inevitably one of the wedges fell out, as did the black slurry within. Unfortunately Cynthia’s snow white and very expensive chef’s apron was the first victim. When the boat was originally built, the plumbing was fitted before any of the boat’s built in furniture so in order to remove the old pipes and radiators, I had to empty cupboards and alcoves, drawers and dressers before BJ could reach them. My boat has plenty of storage space but all of it is used, especially now Cynthia has moved all her worldly goods on board. Consequently when a section of the boat needs clearing so work can be done there’s very little free space to move it to. The boat looked like a bomb had hit it. The door frame between bedroom and engine room didn’t survive the explosion. The frame had clearly been a problem for many years. Two copper pipes ran through it to the old heating system’s header tank in the unheated engine room. 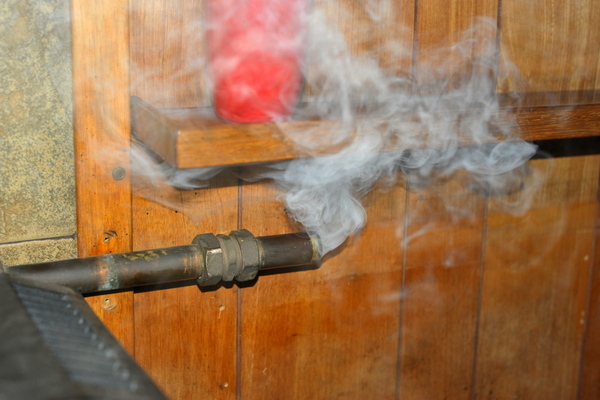 The hot metal pipes running through the cold space meant that condensation formed on the copper then ran along the pipes back to the door frame where it soaked into the wood. The door frame fell apart when the pipes were removed. You can see the extensive damage in the photo below. A block board patch has been put in place until I can have the door frame rebuilt next year. The patch is an effective but unsightly short term remedy. All of the destructive work was done on Tuesday. I spent a couple of hours on Tuesday evening cleaning up the mess, taking the dogs through the slipway slurry to a muddy patch of nearby grass to attend to business, and then cleaning muddy paws before settling down for a couple of relaxing hours before bed. When Justin disconnected the old radiators from the stove’s back boiler he told me that I might notice a little steam rising from it until all the water evaporated. I hadn’t had any heating on in the boat during the day. There was no point. The front and rear doors and the side hatches were open to allow access. By early evening the boat was cold so I lit the fire and settled down with my Kindle and a large glass of red for a much needed break. I noticed the promised hint of steam after about twenty minutes. 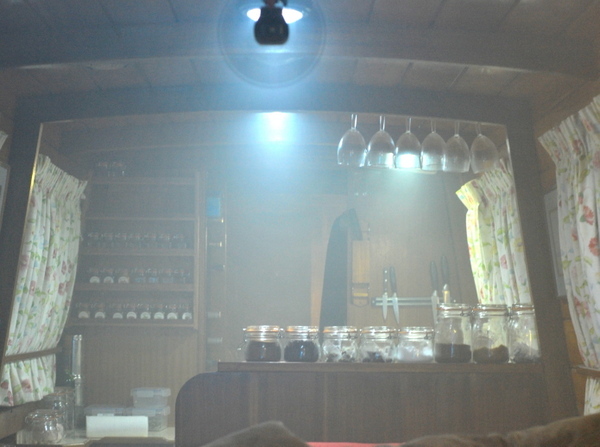 Then the hint of steam gradually thickened and swelled until clouds of billowing and acrid smoke filled the cabin. I had to open both front and rear doors wide, turn on my galley extractor and the powerful fan I have fitted to the cabin roof to push heat from the stove towards the bedroom. I sat wrapped in coat, scarf and fleece hat, wine replaced by hot chocolate, until midnight when the smoke cleared enough to satisfy my every faithful combined smoke and carbon monoxide alarm so I could shut up the boat and go to bed. While BJ began fitting three radiators on the starboard side the next morning, Justin collected another radiator from Daventry’s Screwfix before both of them tackled a little curve ball I threw them the previous day. The three old radiators ran back from the stove on the boat’s starboard side. I wanted three new radiators down that side but I also wanted one fitted on the port side beneath the desk where I often spend ten or more hours sitting motionless typing. For the last five years it’s been quite a cold space. The small amount of hot water flowing back thirty five feet from the stove did little to heat the radiator behind me. I wanted some effective heating in my “office” but that meant running pipes from the engine room, through the bedroom and under my shower tray to the space under my desk. After two tense hours, and much manly cussing and tool throwing, the pipes were through and the new keep-Paul-warm radiator fitted firmly in place. By mid-afternoon the radiators were filled and bled and an unfamiliar but very welcome warmth filled the back of the boat. What a difference the central heating system makes! The back bedroom has always been cold and slightly damp. It isn’t now. Both bedroom and bathroom are toasty warm. I didn’t have enough room in the bathroom to fit a much wanted towel rail but there’s just enough space to drape a pre shower towel over the new radiator behind my composting toilet. What a deep and unfamiliar joy to step out of the shower and wrap myself in a hot and dry towel. Wednesday was a great day. Not only was my much anticipated central heating system complete, but I also received an unexpected and very welcome phone call from Cynthia. She had just received an email from the British Consulate in New York to tell her that her marriage visit visa had been granted and that she was about to book a flight back to Heathrow on Friday. Hooray! By the time the heating system had been tested there was too little light left for me to move away from my mucky mooring at JG Marine so I had another paw cleaning night on the wharf before a dawn start on Thursday back to my discovery day mooring above the Calcutt flight and a day’s intensive cleaning after two days’ turmoil. For the third time in as many weeks I collected a hire car from Enterprise in Daventry, a pretty little red Toyota Aygo this time, before an early night and a ridiculously early start on Friday for Cynthia’s 6am Heathrow arrival. She sent me a text at 6.15am to tell me she had landed, then another at 6.30am to let me know that she was back in her least favourite place in a room at terminal three’s immigration detention suite. Thankfully the delay was just a formality so by 7am she was free to enter England after a nine day, seven thousand mile delay. We took full advantage of the hire car and visited Rugby’s wonderful Abraxas Cook Shop to buy a joint Christmas present, a set of Global kitchen knives. Unfortunately we left one of the knives there so yesterday after stocking up with coal and water at Calcutt we set off on a ten hour round trip, half an hour by car, to collect the missing knife. We didn’t get very far. Saturday was miserable and dank. I love the tranquillity which winter cruising offers but two and a half hours buffeting by wind and rain was enough. I pulled over to a relatively mud free section of Armco barrier on the north Oxford canal about a mile from Braunston and, with some difficulty, moored for the night. A stiff breeze was blowing the boat away from the bank so I had to use my windy weather technique as Cynthia was catching up on some much needed sleep inside. The problem you have as a solo boater when trying to moor a boat which is being pushed away from the bank is that, if you can pull the boat in at all, by the time you have either secured bow or stern, the other end has blown away from you again so you have to begin the whole painful process again. The simple solution when mooring on Armco – a much more secure method on soft and muddy towpaths than pins – is to step off the boat with three mooring chains and your centre line. You pull your boat to the bank with your centre line, then use on of your three chains to secure the boat temporarily via the centre line. Neither bow nor stern can swing away from you with the centre line secure so you can then tie off both ends at leisure. With the bow and stern secure I then remove the centre line chain. With the cabin held down by a line attached to the roof the boat is far more likely to rock in the wake of passing boats. We’re still on that mooring now. Our plans to reach Rugby have changed. We now can’t get there and back to Calcutt in time for the first of my discovery days on Tuesday. I suppose I could just about achieve it if I pushed myself but with heavy rain and high winds forecast for today I’m not keen. We’ll probably hire another car for tomorrow to finish out final joint house making shopping before settling in to our winter marina routine. We’re going to need a car of our own soon. I won’t really need one but Cynthia will be stuck if she has to rely on public transport. Calcutt Boats two marinas are in a wonderful and tranquil location. They’re extremely peaceful because they’re in rural Warwickshire a mile and a half away from the nearest main road. Consequently, access to public transport is difficult. The nearest bust stop is on the main road a mile and a half away. I believe that there’s a service running to the market town of Southam once every two months. Buses possibly run more frequently but certainly not often enough to make the journey into Southam practical. Not that Southam offers much in the way of entertainment or shopping. A modest Tesco store on the town’s outskirts, two much smaller convenience stores in the main street, a bicycle repair shop, two florists, several hairdressers, half a dozen take away outlets and the same number of little visited pubs is all there is on offer. A further bus to Leamington Spa ten miles away is needed for any serious shopping or entertainment. Hopefully I’ll be working back at Calcutt Boats over the winter so I won’t either need or have time for many jaunts off site. Cynthia, on the other hand, is going to go quietly mad before the beginning of April when we begin next season’s cruising. After selling my own car two and a half years ago I couldn’t see myself ever having another. I have to admit though that having a car available recently has been very handy indeed. I’m going to add a car to my Christmas list and pray that Santa thinks I’ve been a good boy this year. At 0602 Friday 27 November 2015 I touched down at London Heathrow for the last time this year….whew–what a relief! As those of you know, who have been faithfully following the newsletter for the past few weeks, you are well aware of the ups and downs we have navigated obtaining the proper marriage vista visa. I spent a long week and spent a lot of money sorting it all out—I was told it would take a couple of weeks to over a month, which didn’t make either Paul or myself happy needless to say! I had only enough clothes and things with me for a 3 day stay. Thanks to my dear friend Christina with whom I stayed, I was provided with a few additions to my wardrobe that helped me through. This past Tuesday morning 24 November, I had a strange feeling shortly after awakening, and at 0822 I received an email that turned my world around—my visa had been granted and printed up! I immediately let the visa services person know and he informed me a short while later that all was in order and I could pick it up the following day. Once I had confirmed all of this, I called Paul straight away (who was standing in the middle of a field as the work was being done on James for the new heating system), and told him the good news—he was as elated as I was! I felt as though someone, once again, had handed me the moon. I immediately made plans to return the rental car and find a suitable airbnb spot in Manhattan the next day so I would be in place to take the 1825 flight back to Heathrow the following day, Thursday, 26 November which was Thanksgiving Day for us in the US. All my thankful energy was directed towards Paul who has made this horrendous immigration ordeal a cakewalk. He never let me down and remained tireless in dealing with all the aspects of this at his end, and lovingly supporting me—and all of this while having to cope with the heater installation as well as the day-to-day chores AND looking after the dogs! I booked my passage across the pond on American Airlines, from whom I am retired. I was lucky once again, as I was able to settle into a Business Class seat and enjoy the nice service along with a flat bed fit for a good nights sleep. When I arrived at Heathrow and it was my turn to step up to the Immigration officer, I began to feel a bit nervous as memories of my nightmare of two weeks ago flooded my head. I was escorted to the detention box once again, but only as a formality, and five minutes later I was released and able to collect my baggage and make my way as fast as I could out of the immigration hall and into Paul’s welcoming arms. I have never been so happy to see anyone in my life! We had a speedy trip back to James, took a bit of a nap then spent the rest of the afternoon taking advantage of the rental car and went about our shopping. I can’t begin to tell you all how delighted I am to be back on James with Paul and our Bassets. Home again and I couldn’t be more happy or at peace. And I don’t have to cross the pond again until the end of May when I must apply for the next visa, the spousal one. Should be another bit of a roller coaster ride! Stay tuned….. 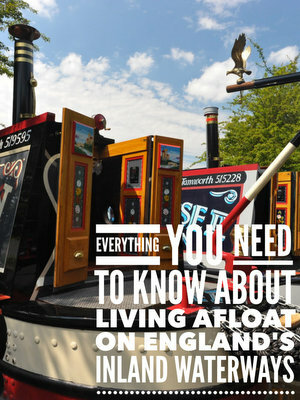 This newsletter now goes out to 6,200 narrowboat enthusiasts. 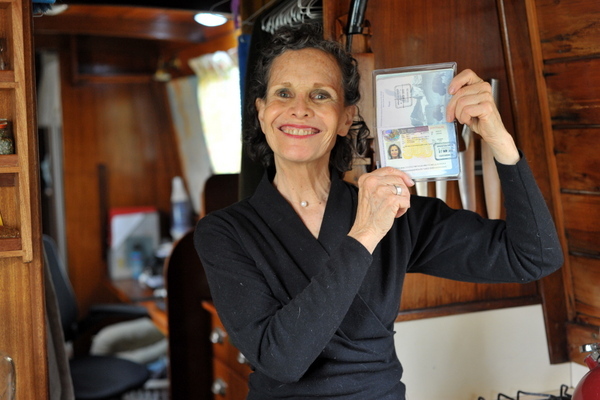 Between 1,000 and 1,500 are current boat owners. If you are one of them I would like your help. Next week’s newsletter will detail handy tools to keep on board. It’s a list inspired by prolific forum contributor Peter Earley. The following week’s newsletter will contain tips and tricks for making the miserable winter months more tolerable. A thousand heads are better than one so PLEASE, if you are a boat owner, spend just a couple of minutes of your time to tell me about your indispensable boating tools and what you do during the cooler months to protect yourself and your boat. The survey is here. Please don’t leave the job for someone else to do because all too often they’ll be expecting you to do it for them so they won’t bother. I run my discovery days roughly on the first ten days or so of April, June August, October and December. If you are interested in joining me for a fun and information packed discovery day before the end of the year, you can book the single remaining date by viewing the diary here. You may want to stay locally the night before, the night after or both, in which case I highly recommend this B & B. It’s a five minute stroll from the mooring where I begin my discovery days.